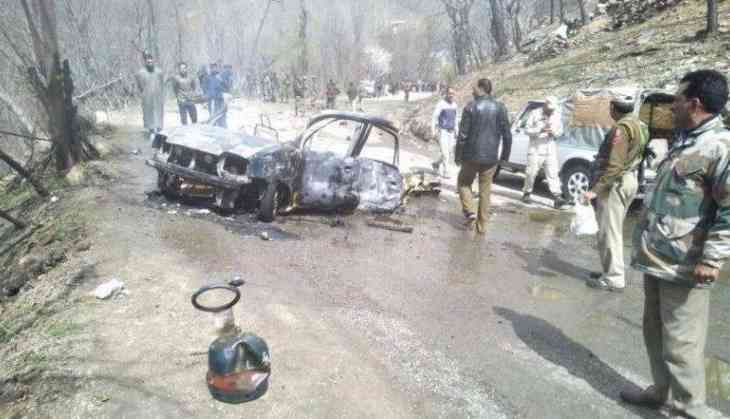 The car blast in Banihal area near Jammu-Srinagar highway on Saturday, was an abortive attempt to carry out a Pulwama-like suicide terror bombing attack on the Central Reserve Police Force (CRPF), says suicide note recovered by the police. According to PTI, a note recovered from the scene had identified the driver as a Hizbul Mujahideen operative, who mentioned his intention to carry out a February 14 Pulwama type terror attack which left 40 CRPF personnel dead, was supposed to die in the Banihal car blast. However, at last moment he changed his mind and abandoned the vehicle before the explosion. The terrorist has been identified as Owais Amin, has been arrested, reported PTI. According to TOI, in his suicide note, Owais mentioned the youngest pellet gun victim, 18-month-old Hibba Nisar and Kashmiri teacher Rizwan Asad Pandith who died in police custody on March 19. He said he was strapping himself with explosives to avenge the “atrocities” committed by “Baharat” against the people of Kashmir. "I want to know from the sensible Indian people as to why Rizwan Assad Pandit was martyred. He had neither touched a gun nor gone to across the border. He was an innocent Kashmiri youth. This is why I preferred death to life and I hold it as my good luck," the suicide note reads. "I have decided to avenge these atrocities by strapping myself with explosives and blowing up ‘Indians’ responsible for the same," Owais said. Jammu and Kashmir Police and the National Investigation Agency (NIA) are conducting a probe into the cylinder car blast. There were loss of life in the blast. Howver, CRPF vehicle was slightly damaged in the explosion.